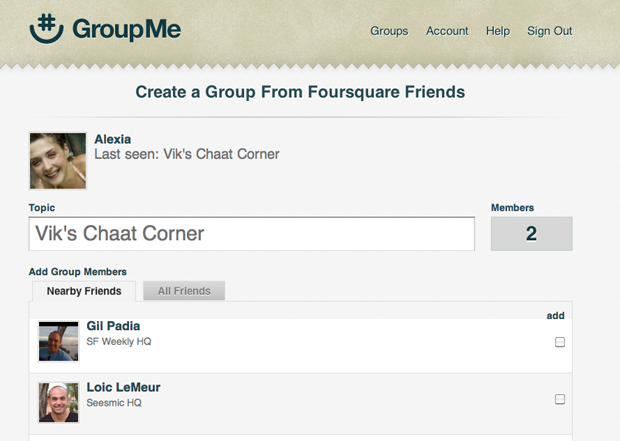 TechCrunch Disrupt finalist Groupme has launched a cool new feature today, in advance of tomorrow’s Foursquare hackday. People who link their Foursquare accounts to Groupme here can now pull up an interface of all Foursquare friends in the vicinity of their last checkin. You can then select which friends you want to be a part of a texting group, and the app will notify those selected with a text and the group’s number. This is first group texting app I’ve seen to incorporate geo-location — The feature is perfect for the use cases of Coachella-like music festivals, sprawling tech conferences like SXSW or any other place where tons of smartphone wielding individuals tend to congregate in large groups. Groupme is also open sourcing much of the code behind the new feature, humorously naming it after pop singer John Mayer. Right now the feature isn’t integrated into either service’s mobile app and can only be accessed by those sober enough to remember to visit groupme.com/foursquare on web or on mobile. Hopefully Groupme will use some of its $10.6 million in funding to develop in-app integration some time soon, before SXSWi preferably.